Has Facebook’s Mark Zuckerberg just killed off email? “Email is dead, long live social mail,” was the effective cry of Facebook founder Mark Zuckerberg. Channel 4 News Technology Correspondent Benjamin Cohen asks whether Zuckerberg just killed off email. 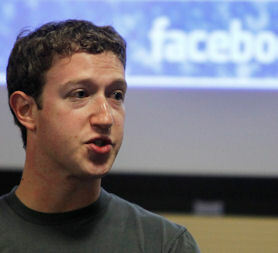 “Email is dead, long live social mail,” was the effective cry of Facebook founder Mark Zuckerberg. And when I say social mail, you know I’m effectively saying Facebook mail and this provides a unique threat to the dominant players in email; Yahoo, Google and Microsoft (who own a tiny stake in Facebook). SMS messages, emails and instant messages will appear in a single Facebook feed and users will be able to respond in the medium that best suits their friend or the situation. I’m not going to go into great depth about the various intricacies of Zuckerberg’s announcement but the key fact is pretty stark- Facebook powered email has the potential to be more efficient and less riddled with spam than traditional email services and for someone like me who gets overloaded with spam, marketing emails, press releases, invitations and the like all into the same email address this couldn’t be more welcome. I currently use a handful of different email addresses and services: my Channel 4 News email account that combines work emails, emails from close friends and tons of press releases, a personal Gmail account that again is used by some friends together with every company that has gathered up my email account details in the past six years, and a few others used for various business ventures powered by Google’s Application service. The end effect is that when I look at my combined inbox on my iPhone, I have to wade through over a thousand incoming emails per day and it’s really easy to miss something that’s actually quite important. Google’s Priority Inbox tries to predict what’s actually important and what’s not but more often than not it misses something. Now the only people who can send me messages on Facebook are my friends and the groups/products/events I’ve given permission to contact me thanks to my privacy settings. The friends who can reach me have all had to be authenticated by me in the past. So you can guarantee that the messages I receive are likely to be from someone who I actually want to hear from. So my Mum for example knows that if she sends me a message via Facebook that I’m more likely to a) read it b) reply. So it all makes a great deal of sense for me as a user at least. And it proves a great challenge to Google who in the most part are not privy to something like Facebook’s Social Graph that maps out your various friend/family relationships and they are unlikely to in the immediate future as their own social networking attempts have been of only limited success. Bit by bit Facebook has been growing in power and relevance. The dominance that Google once seemed to hold over our digital lives seems to be fading and it’s Facebook which is quickly becoming the fabric that holds our digital lives together. Scary stuff given the company’s relative youth. If there is an essential truth in the announcement and Zuckerberg succeeds in redefining email, something else changes. Email was once independent, system and operator neutral. If we all use Facebook to send all of our e-communications, that independence dies and email becomes proprietary, the domain of one privately held company. Is this something that we should be worried about?